Cancer - Melanoma | Chondrex, Inc. Immune checkpoint blockade therapies enhance antitumor immune responses and work effectively in particular cancers such as melanoma. The immune checkpoint therapies target receptors such as CTLA4 (cytotoxic T lymphocyte antigen-4) and PD-1(programmed death-1) on cytotoxic T-cells, and their respective ligands, such as PD-L1 and B7-1 (CD80), on tumor cells. Antibodies can inhibit binding of these receptor/ligand pairs, disrupt the signals for cytotoxic T-cells, and accelerate immune responses against cancer (1-6). Investigating the effects of these therapeutic antibodies requires different types of rodent cancer models. In the studies, same-species antibodies must be used because administered heterogonous antibodies will be inactivated by the host's immune response. In fact, heterogonous antibodies only work for short-term animal studies such as melanoma models (2-6). Chondrex, Inc. provides mouse anti-mouse CTLA4 and PD-L1 antibodies which prevent the binding of their respective receptor and ligand. These antibodies are applicable to many types of mouse cancer models and are especially useful for long-term animal studies such as carcinoma models (7). 1. Efficacy of anti-immune check point antibodies in mouse melanoma models. C57BL/6 mice received B16 melanoma cells (5 x 104 cells) intradermally on day 0, followed by intraperitoneal injections of 300 µg of monoclonal antibodies on days 3, 6, 9, and 12. Tumor sizes were evaluated every 3 days until day 27. 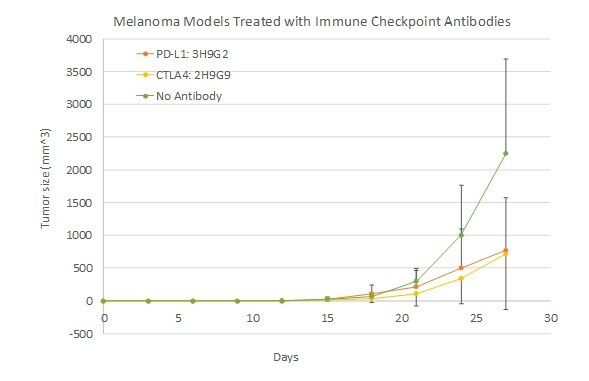 Chondrex, Inc's mouse anti-mouse immune checkpoint monoclonal antibodies (3H9G2: anti-PD-L1 and 2H9G9: anti-CTLA4) prevented 70% of melanoma tumor growth (Figure 2). More specifically, 90% of melanoma cell growth was inhibited in 3 out of 4 mice who received 2H9G9 and in 2 out of 4 mice who received 3H9G2 (Figure 3). Cytokines and chemokines, such as TNF-alpha, IL-6, and CXCL1, regulate cancer cells as growth factors and play roles in metastasis (8-11). Chondrex, Inc provides ELISA kits to detect cytokines and chemokines in both mouse and human samples. Tumor-immune cell crosstalk may play a role in metastasis of malignant cancer. Small membrane vesicles, exosomes, work to educate recipient cells by transporting miRNA, DNA, lipids, and cancer proteins, resulting in a proliferation of tumor cells, tumor niche remodeling, metastasis, and tumor-associated inflammation (11-15). To analyze the contribution of exosomes in the cancer dynamic, especially metastasis, Chondrex, Inc provides human exosome detection kits (CD9 expressed, CD63 expressed, and CD9xCD63 expressed exosomes). These kits can determine exosome concentrations in serum or culture media. Chondrex, Inc. now is working on developing exosome isolation kits using CD9 and CD63 as the tags(16). Immune-checkpoint therapy can be adapted to treat infectious diseases such as sepsis (17-20) or viral infections. Indeed, adverse events of immune checkpoint therapy include symptoms of autoimmune diseases due to an overactivated immune response (23) Chondrex, Inc provides autoimmune arthritis models such as collagen-induced arthritis (CIA), collagen antibody-induced arthritis (CAIA), adjuvant-induced arthritis (AIA) and antibody-induced nephritis, which are induced by activated immune responses. These animal models would benefit studies seeking to reduce or control the symptoms. R. W. Jenkins, D. A. Barbie, K. T. Flaherty, Mechanisms of resistance to immune checkpoint inhibitors. Nature Publishing Group. 118, 9–16 (2018). A. Sivan et al., Commensal Bifidobacterium promotes antitumor immunity and facilitates anti–PD-L1 efficacy. Science. 350, 1084–1089 (2015). M. Vétizou et al., Anticancer immunotherapy by CTLA-4 blockade relies on the gut microbiota. Science. 350, 1079–1084 (2015). M. A. Curran, W. Montalvo, H. Yagita, J. P. Allison, PD-1 and CTLA-4 combination blockade expands infiltrating T cells and reduces regulatory T and myeloid cells within B16 melanoma tumors. Proceedings of the National Academy of Sciences. 107, 4275–4280 (2010). M. J. Selby et al., Anti-CTLA-4 Antibodies of IgG2a Isotype Enhance Antitumor Activity through Reduction of Intratumoral Regulatory T Cells. Cancer Immunology Research. 1, 32–42 (2013). W. W. Overwijk, N. P. Restifo, B16 as a Mouse Model for Human Melanoma (John Wiley & Sons, Inc., Hoboken, NJ, USA, 2001), vol. 185. D. M. Lussier, J. L. Johnson, P. Hingorani, J. N. Blattman, Combination immunotherapy with α-CTLA-4 and α-PD-L1 antibody blockade prevents immune escape and leads to complete control of metastatic osteosarcoma. J. Immunotherapy Cancer. 3, 21 (2015). W. Peng et al., PD-1 Blockade Enhances T-cell Migration to Tumors by Elevating IFN-g Inducible Chemokines. Cancer Research. 72, 5209–5218 (2012). D. G. Brooks et al., IL-10 and PD-L1 operate through distinct pathways to suppress T-cell activity during persistent viral infection. Proceedings of the National Academy of Sciences. 105, pnas.0811139106–20433 (2008). K. E. Lewis et al., Interleukin-21 combined with PD-1 or CTLA-4 blockade enhances antitumor immunity in mouse tumor models, 1–17 (2017). K. S. N. Atretkhany, M. S. Drutskaya, S. A. Nedospasov, S. I. Grivennikov, D. V. Kuprash, Chemokines, cytokines and exosomes help tumors to shape inflammatory microenvironment. Pharmacology and Therapeutics. 168, 98–112 (2016). J. L. Hood, Melanoma exosomes enable tumor tolerance in lymph nodes. Medical Hypotheses. 90, 11–13 (2016). J. Wang, Y. Zheng, M. Zhao, Exosome-Based Cancer Therapy: Implication for Targeting Cancer Stem Cells. Front. Pharmacol. 7, 4360–11 (2017). G. Chen et al., Exosomal PD-L1 contributes to immunosuppression and is associated with anti-PD-1 response. Nature. 560, 382–386 (2018). Top, Tumor-derived exosomes in cancer progression and treatment failure, 1–18 (2015). L. Esposito et al., Investigation of Soluble and Transmembrane CTLA-4 Isoforms in Serum and Microvesicles. The Journal of Immunology. 193, 889–900 (2014). T. Yamazaki et al., Blockade of B7-H1 on Macrophages Suppresses CD4+ T Cell Proliferation by Augmenting IFN-gamma-Induced Nitric Oxide Production. The Journal of Immunology. 175, 1586–1592 (2005). T. Kanai et al., Blockade of B7-H1 Suppresses the Development of Chronic Intestinal Inflammation. The Journal of Immunology. 171, 4156–4163 (2003). M. N. Wykes, S. R. Lewin, Immune checkpoint blockade in infectious diseases. Nat Rev Immunol. 18, 91–104 (2017). P. Brahmamdam et al., Delayed administration of anti-PD-1 antibody reverses immune dysfunction and improves survival during sepsis. Journal of Leukocyte Biology. 88, 233–240 (2010). C. E. Engeland et al., CTLA-4 and PD-L1 Checkpoint Blockade Enhances Oncolytic Measles Virus Therapy. Molecular Therapy. 22, 1949–1959 (2014). S. Sandigursky, G. J. Silverman, A. Mor, Targeting the programmed cell death-1 pathway in rheumatoid arthritis. PubMed - NCBI. Autoimmunity Reviews. 16, 767–773 (2017). M. van der Vlist, J. Kuball, T. R. D. Radstake, L. Meyaard, Immune checkpoints and rheumatic diseases: what can cancer immunotherapy teach us? Nat Rev Rheumatol. 12, 593–604 (2016).